When your Roof is inspected by a Hialeah Roof Repair professional we don't fool around. We take the time to inspect the tiles, check their placement and integrity. We carefully check for cracks in the tile and the mortar to ensure your roof is intact. The integrity of your roofing system starts with a waterproofing barrier and continues on to the Roof Tiles that show. The entire system of individual components has to be maintained. We know this at Hialeah Roof repair and encourage consistent Roof Cleaning and Maintenance to extend the life of your roof and maintain the value in your investment. A Replaced tile doesn't mean that the entire roof needs to be replaced. It's actually the very opposite. Replacing Tiles when they are cracked and before they have allowed water to permeate the waterproofing barrier is exactly what extends the life of your Roof. Maintaining your roof's integrity is what keeps your belongings and family members safe and dry from the weather and environmental elements of the outdoors. Call us for a Roof inspection if you suspect that one or more of your roof tiles may be loose, or broken. We can check the entire surface of your home to ensure your home is safe from water damage, pest infestation or anything that can happen from a breakdown in the roofing system. Once the Roof inspection has been completed our Roofing Specialist will bring you their findings and discuss a plan. If you have loose or broken tiles, cracked mortar or simply need some roof cleaning he will discuss that plan with you. Once the plan has been arranged and a date for the process to occur has been set, we'll come out and get started immediately. We would be sure we have an exact match for your roof tile. Same color, same size. same quality and in most cases same manufacturer. On appointment day, the Roofer then goes to your roof, removes and debrides the adjacent tiles and mortar. The underlying area is then scraped and cleaned, ensuring the best possible surface for adherence of the new mortar and tile. Decide on a Good Roof Maintenance Plan that provides you with the options of Roof Tile Replacements. 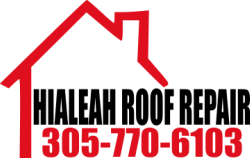 Even with a brand New Construction roof Hialeah Roof Repair prides itself on Plans that maintain the value of your new investment. We know what it's like to maintain property. Let us help you to make the most of your maintenance dollar.